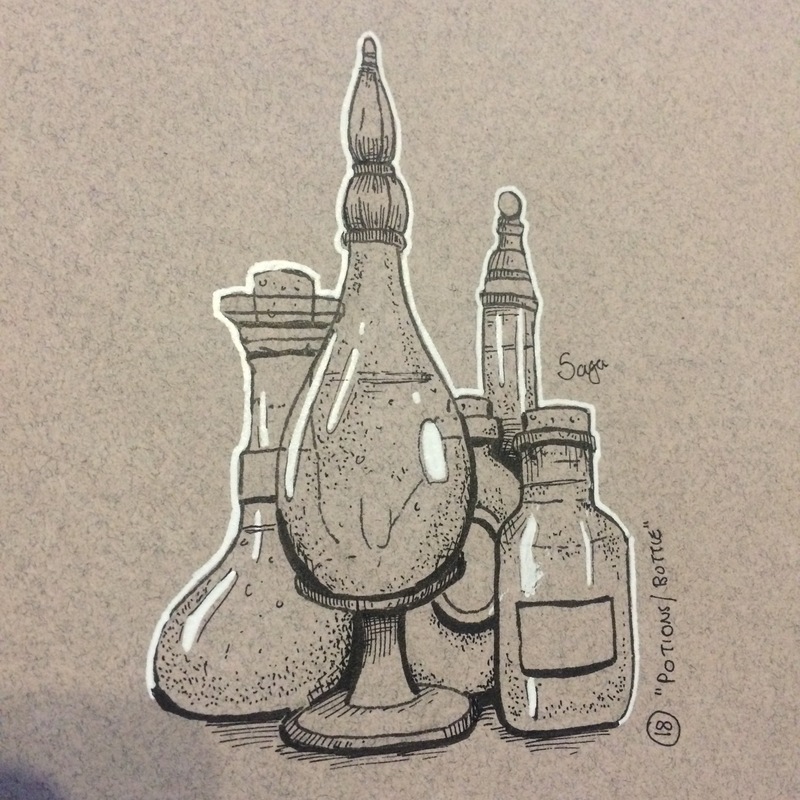 Day 18 - "bottle / potions"
Going to be in Edinburgh for our mini Euro slap n' tickle weekend from Friday so i want to try to jump ahead a few prompts so that i don't fall behind, so i'll probably try to get at least a couple more done by tomorrow. Blah. Today I left my keys on my desk, which wouldn't be a problem except for the fact that I park nearly a mile from my office, and didn't realize this fact until I reached my car. I'm now exhausted and cranky, and didn't feel like drawing. But I haven't missed a day yet, so screw it. Sailboat time. 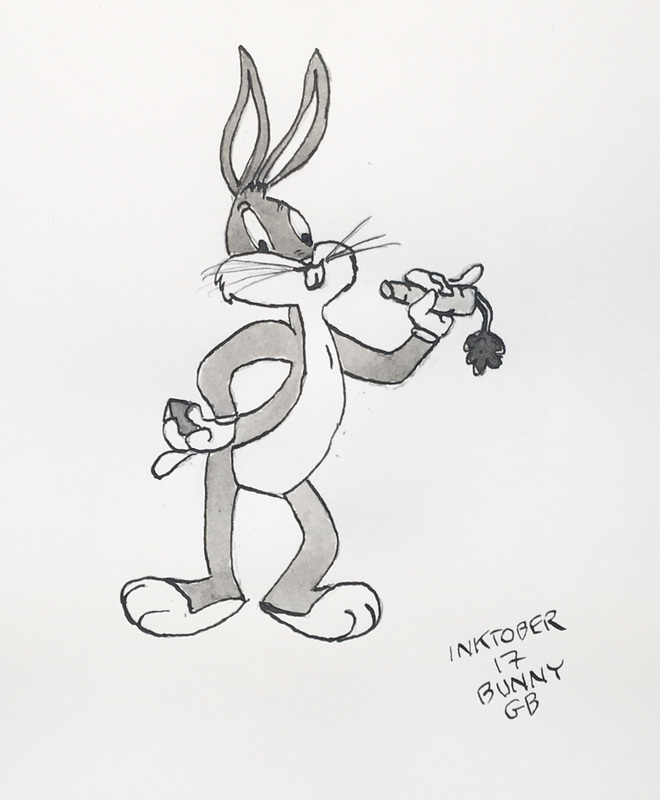 Back to the dip pens and brush for a little Bugs Bunny fan art. Oh I can't wait until next week. I just got a plugin for the 3d software I love that does exactly what I'd hoped it would do. My play opens tomorrow night so I will get my free time back after this weekend. Which means a lot more posting of (hopefully awesome) WIPs from me! I started stippling a mango. Then I decided the mango should have a human mouth. I also decided that mouth should be screaming. It's been a long week, people. I wanted to try shading with the pen on this one. 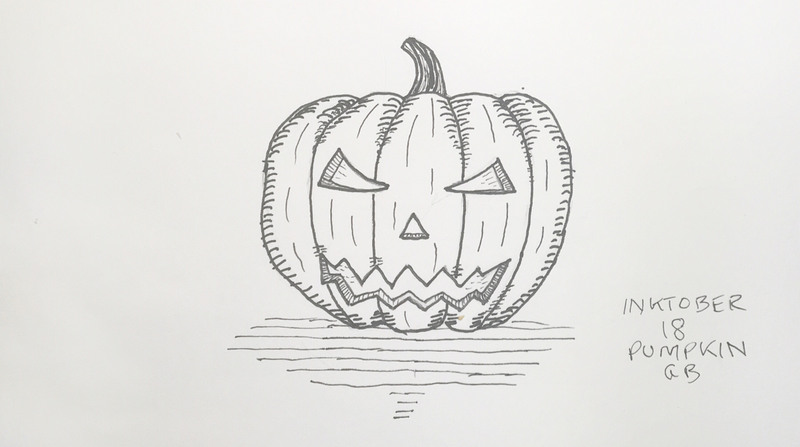 A couple sections I like, but I don't think it worked with with the crevices on the pumpkin. Definitely a work in progress for me. I'm not sure what most of that means, but I look forward to seeing more of what you're working on! 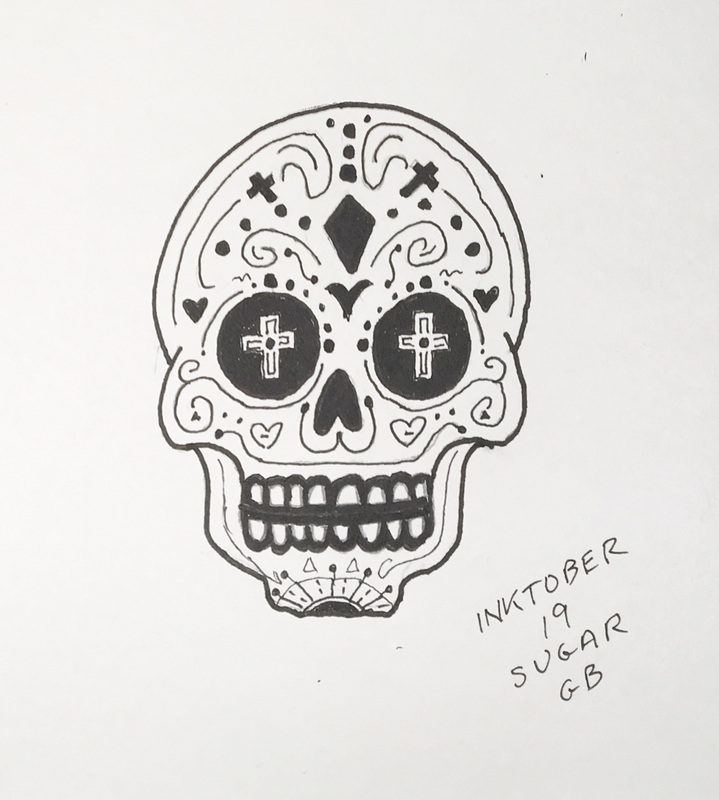 Sugar skull. Getting the balance right on this one was challenging, lots of places where it just didn't work out. Fun to try though. 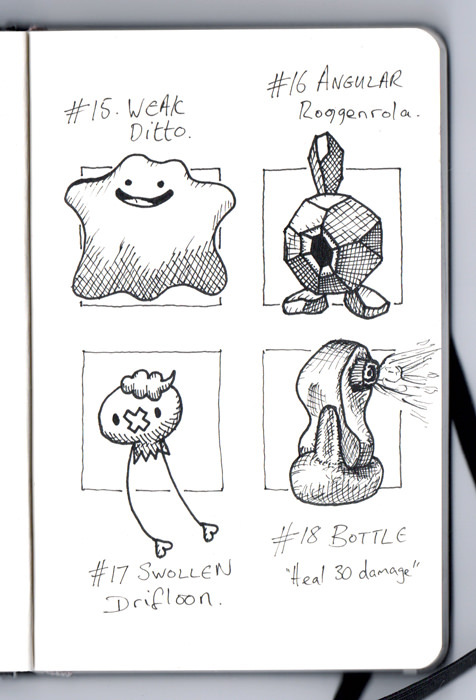 I wasn't too inspired by today's prompt, and was tempted to just go in a different direction. But then I decided I could use it to spend some time on shading. Most definitely needs work. 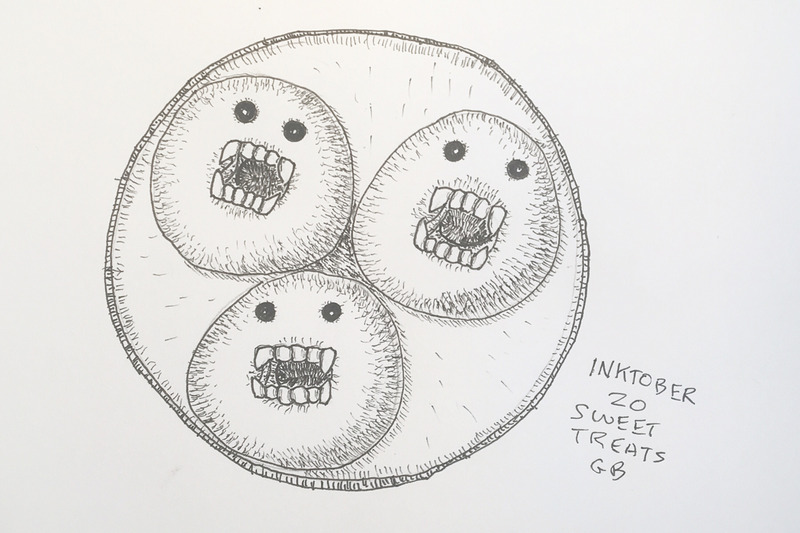 EDIT: I showed this to my daughter and she couldn't even tell what they were. 20 Days down though, 11 to go! I'm heading out of town for the next few days, but I hope to carve out time in the evenings to keep things going. Ah man Trichy, practice really does make perfect. Impressive beetle! I am really curious as to how you feel now trichy? I'm betting, like me, at some point you crossed a bridge and now see the world differently. What sticks out to you the most? I am super curious about your perspective. Good work GBlitz and Trichy keeping it going. Yeah, trichy the last few things you posted have been super good! I don't really know. I know I'm paying closer attention to stuff that I look at. I'm actively trying to see the geometric forms in objects, and the various values when it comes to shadows. It's not automatic at all. 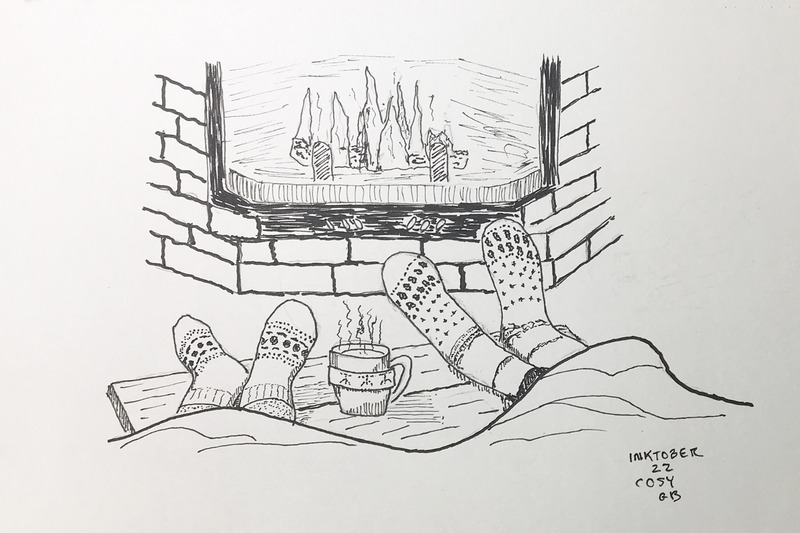 Probably the best resource that I've had in regards to how I should change the way I look at / think about stuff is Alphonso Dunn, who has a terrific YouTube channel about pen and ink drawing. His stuff has been the bulk of what I've been spending time on this month. I have Proko's figure drawing course (birthday gift from the guy who pushed me to do this in the first place), so I'm planning on really digging into that in November/December. It's really strange. I can look at the stuff I'm doing and see actual progress, but I still feel really freaked out when I get started on something. It doesn't feel like I'm any better than I was when I started, even though I know that's measurably untrue. But as stressful as the process is, I'm finding that I get a bit antsy if I'm not at least doodling for a bit. I don't know what that means, but I'm hoping it means this is becoming more and more a part of my life. That's a lot of rambling for a relatively simple question, so TLDR: While it's not automatic, I'm actively working to try to see stuff from a structural and lighting perspective. Nope, that is a good answer, very encouraging and what I was hoping anyone discovers. I think the only thing I'd add to that is that there doesn't need to be a goal or an end. This one was a bit rushed, but I kind of like it. Thanks, Bubble! I hope you can catch up! Urg, one of these feet got hit with an ugly stick. I'm finding that there is no Control-Z with ink, and then sometimes the more I mess with it the worse it gets. Oooh. Eurogoodjers get together, who made it and fun times? Not great, but playing around with perspective a bit. Took a bit to come up with something not so gruesome for this one! First fully freehand attempt. No pencil underdrawing. 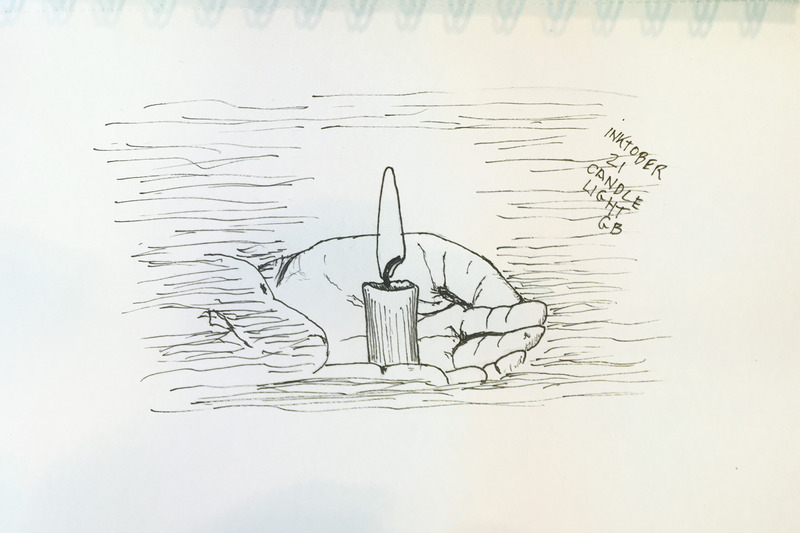 I had to draw this one at an airport gate while waiting to board. 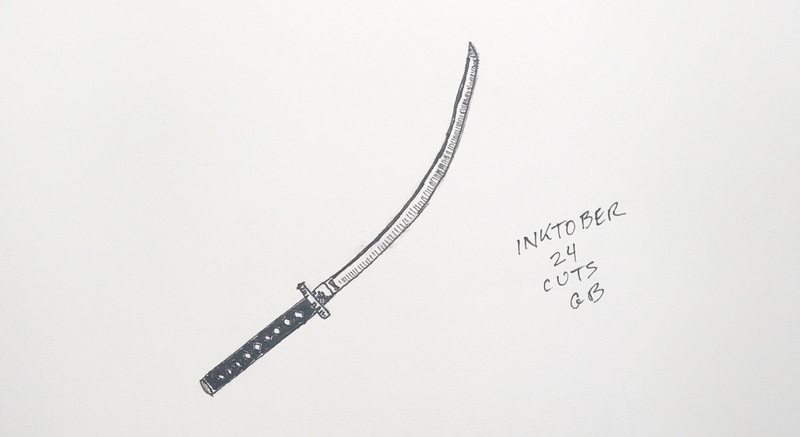 The Day 24 prompt was "cut", which seemed a bit violent to be drawing with lots of other people around waiting to get on a plane. 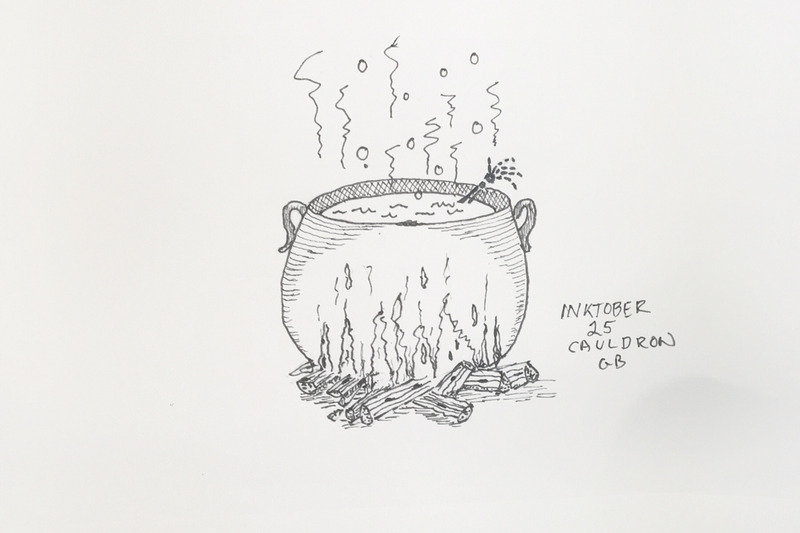 I shifted to tomorrow's prompt, "cauldron", and tried to draw a picture without looking at another image for reference. 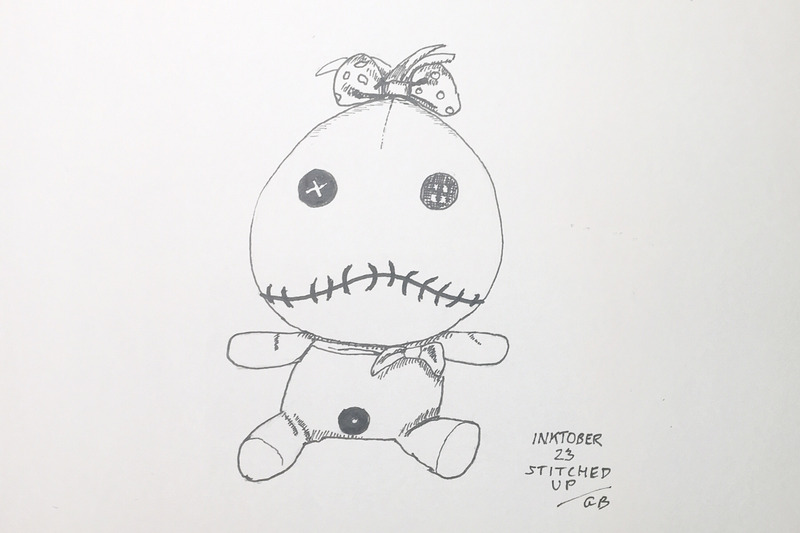 I'll try to do Day 24's prompt tomorrow. Now that I'm back home things should get easier to do. I pretty much dialed it in today. After being gone for four days, I had a ton of work and family stuff to catch up on. 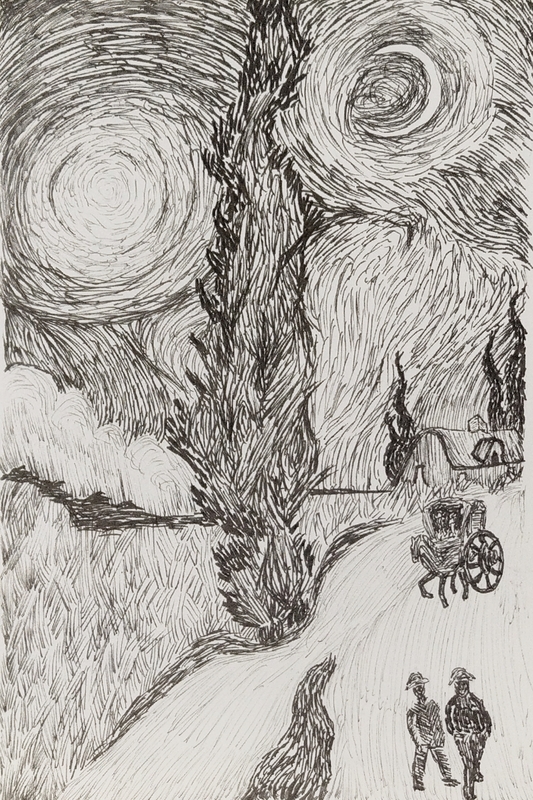 By the time I sat down to draw it was well after midnight and the tank was on empty. Glad I got something done, and hoping to have more time/energy tomorrow. Finally had a chance to catch up just a little this morning.